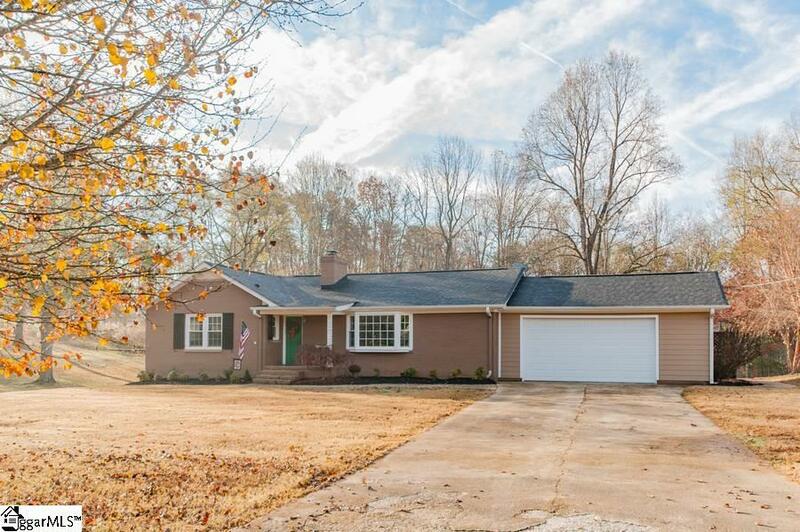 Wonderful updated brick 3 BR 2 BA home with 2 car garage. Hardwood floors throughout with open floor plan with great room featuring wood burning fireplace opening to dining area, and kitchen. It has a stamped concrete walkway, tile front stoop, and HUGH deck overlooking the beautiful/spacious backyard. This lot is approximately 1.10 acres and has lots of mature trees and a shed/barn for outside storage to convey âas isâ. There is also a lower level with concrete flooring for lots of storage (stand-up height). Built-in cabinetry for extra storage/pantry area in kitchen area, beautiful kitchen countertops with large granite center island for more storage, stainless steel smooth top range, refrigerator, DW, and built-in microwave, with under counter lighting, upgraded cabinetry, and tile backsplash. Walk-in Laundry room on back of home with ceramic tile flooring has door leading to back deck (washing machine is located in closet beside laundry room). All 3 bedrooms are a good size. Private master bath has a stunning glass walk-in shower with updated vanity and control for heated ceramic tile floor! Hall bath has tub and surround, some bead board walls, and updated vanity. There is an area in the back of the house which is paved with a roof over it and sellers have dog kennels underneath it - kennels do not convey. It is move-in ready and located on a quiet street on over a 1 acre lot with wonderful neighbors all around. This is a must see!